Dr. Robert Curvin (1934-2015 ) was an iconic civil rights activist and urban scholar. A loyal advocate for Newark he believed in the city but was also realistic about the outlook for Newark including the educational and employment challenges the city faced. He was also quite candid when expressing his disappointment in the city’s mayors. His activism began in earnest in 1960 , when after a five year stint in the army where he achieved the rank of first lieutenant, he graduated Rutgers Newark . Having joined the N.A.A.C.P as a teenager he decided after graduating Rutgers that the N.A.A.C.P. was too moderate, so he helped found the Newark chapter of the Congress of Racial Equality. He rose within that organization to the national vice chair and also lead the Newark chapter . The chapter, which was racially diverse, fought against police brutality and discriminatory hiring. Their lobbying efforts, in the early 1960’s, to bring more minorities into the construction trades was quite successful. In that fateful year of 1967, he took his civil rights advocacy to the streets trying to quell an angry crowd in front of the Fourth Precinct, where they had gathered believing that the police had beaten, John Smith, a black cabbie, to death. Having had the opportunity to see the cabbie, who was beaten, but alive , he attempted to persuade the crowd to march on city hall and not riot. 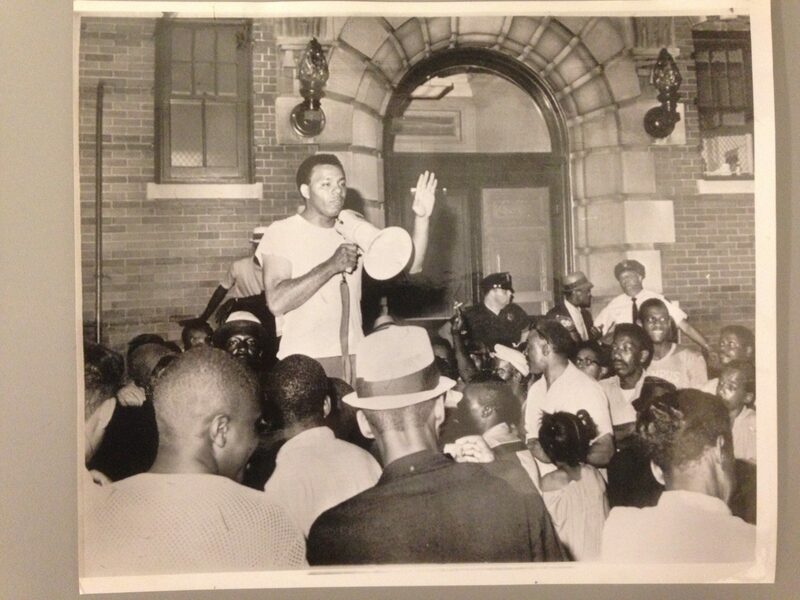 The iconic photo included in this post shows him exhorting the crowd, in front of the police station, not to riot. His pleas went unheeded. He described what ensued as a rebellion , not a riot. In a Star -Ledger article, published in 2014 ,he further explained,” In a rebellion there is at least the aim to try to affect government actions and policy. Using the term “riot” suggests they had no justifiable cause to behave the way they did”. In 1968, he helped establish New Community Corporation as a founding board member. For those who may be unfamiliar with New Community, it was created to initially help rebuild the Central Ward which had been heavily impacted by the events of 1967 and 1968. NCC as it is known built housing, provided social services and provided job training. It was run for many years by Fr. William Linder, who is still active and involved in the organization. In 1970, he helped make Kenneth Gibson the first black mayor of a major northeast city. He became a trusted advisor to Mayor Gibson. He also proved to be a valuable resource to Gibson’s successor Sharpe James. While available to assist when needed, he declined to become a city employee. The New York Times editor Max Frankel appointed Dr. Curvin to the Times editorial in 1977. He remained in that position for seven years. He was director of the Ford Foundation’s Urban Poverty Program from 1988-2000; dean of the Milano School of Management and Urban Policy at the New School; and visiting scholar and professor at the Edward J. Bloustein School of Planning and Public Policy at Rutgers. Dr. Curvin had a degree in biology, a masters in social work and a doctorate in political science from Princeton. In 2014, Dr. Curvin’s last book” Inside Newark Decline, Rebellion and the Search for Transformation”, was published. The book was an in-depth look at the city’s path since 1967. Although he identified the many challenges Newark faced he expressed hope that the violence and corruption could be mitigated and that over the long term the city’s fundamental problems could be overcome. He never lost hope or faith in the people of Newark and the potential of the city. His was truly an exemplary life. I first met Robert Curvin when he came to meetings of The Newark Water Group. Bob new the importance of protecting the principals of the Public Commons. When Bob entered a room his profound dignity filled the room and embraced everyone in it. His presence moved me deeply. Thanks for your recollection Bill.